TAX OR MANDATES: Whether by carbon pricing or green energy mandates, the green agenda is to eliminate all carbon dioxide emissions from Vermont. 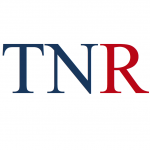 A presentation to a joint meeting of the House Natural Resources, Fish, and Wildlife and the House Energy and Technology committees said the goal was attainable. 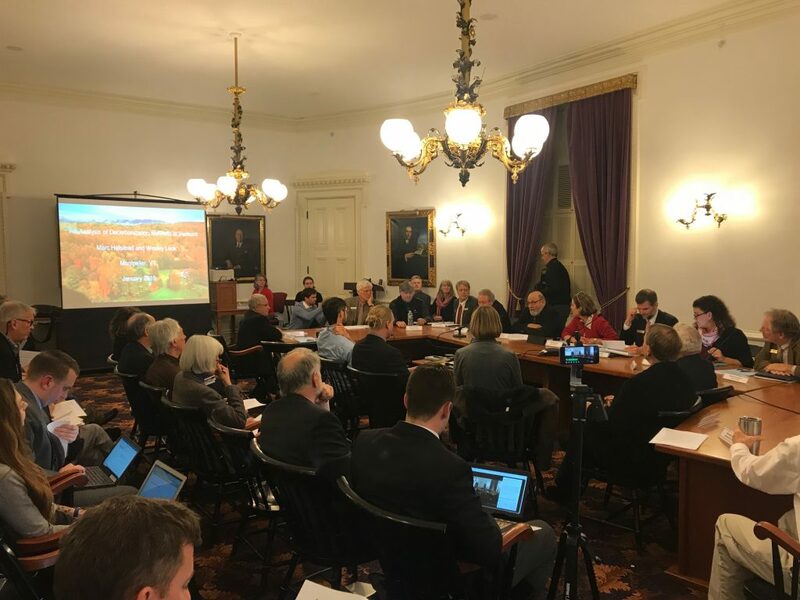 MONTPELIER — A much-anticipated report commissioned last year by the state of Vermont says putting a price on carbon could reduce CO2 emissions without hurting the economy or low-income residents. When it comes to studies on carbon taxes and green energy mandates, there’s been a sharp contrast between what’s paid for by the state versus what comes from the private sector. Such was the case Tuesday when Washington, D.C.-based Resources for the Future released its study on decarbonization methods in Vermont. In contrast with other research showing that methods of reducing carbon are costly to businesses and taxpayers, RFF’s report concludes that carbon reduction initiatives will not only be gentle on the economy, but will result in a net economic benefit for the state. Tuesday afternoon, study authors Marc Hafstead and Wesley Look presented their findings to a joint meeting of the House Natural Resources, Fish, and Wildlife and the House Energy and Technology committees. The researchers found that in order to get carbon emissions down to the goals policymakers are striving for, both carbon pricing and non-carbon pricing schemes will be necessary. The ultimate goal is to achieve “net-zero” carbon emissions by 2050. Carbon pricing is essentially the carbon tax. The four proposals reviewed in the study are the ESSEX Plan, the Western Climate Initiative, the Transportation and Climate Initiative, and the “high carbon price” plan. Carbon pricing also includes the cap-and-trade schemes, which essentially involve buying and selling carbon credits. The second group is the non-carbon pricing ideas. These include green energy mandates such as renewable energy portfolio standards, which require that electric utilities use increasing percentages of green energy over time. These can also be green energy incentives such as subsidies and rebates for electric cars and solar installations. On the key findings page, the study acknowledges that even with using both non-pricing and pricing efforts in combination, it will be difficult to achieve 26 to 28 percent below 2005 carbon emission levels by 2025, which is the next big goal on the horizon. “Vermont has a high share of emissions from transportation and heating fuel use; both sectors are difficult to decarbonize through carbon pricing or non-pricing policies,” the report states. One recommendation is to use the revenue from carbon pricing to fund non-pricing initiatives like electric cars. However, by taking this approach, it becomes harder to make the tax revenue neutral. “If we use a revenue-neutral policy, then you all will be looking for somewhere to pay for those [non-pricing] policies,” Look said. 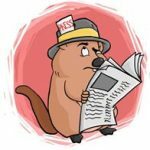 All the number crunching by Resources for the Future seemed to indicate that a net economic benefit would result through rebates and improved environmental conditions, as well as by having healthier Vermonters. According to the study, the initial “Change in Economic Welfare per Household” ranges from minus $28 to $240 depending on the carbon pricing plan. However the estimated “Environmental Benefits per Household” ranges from $56 to $317. “We project that the benefits per household will exceed the cost for every single policy we look at,” Hafstead said. Hafstead said some of those environmental benefits were calculated using “social cost of carbon estimates.” At one point he was asked specifically about the impacts of carbon mitigation for Vermont. These rosy predictions are not what other studies, such as those highlighted by the Ethan Allen Institute, have indicated. One report by EAI’s policy analyst David Flemming applied the Essex Plan cost/rebate formula to six Vermonters, and it found in some cases households at around $20,000 income were still losing several hundred dollars even after collecting hefty rebates. Of the four carbon tax proposals analyzed by Resources for the Future, the Essex Plan was among the more mild proposals. Rep. Timothy Briglin, D-Thetford and the chair of the House Energy Committee, asked about the policies’ impacts on Vermont’s most economically vulnerable. Hafstead answered that redistribution of carbon pricing revenues should mitigate impacts on lower-income Vermonters. Gov. Phil Scott ran in 2016 largely on an anti-carbon tax platform. However, his appointed climate action commission is on board with some non-pricing strategies, such as subsidizing electric vehicles. Meanwhile, on social media, stakeholders are already making their opinions known. The fuel industry, in particular, isn’t thrilled with the authors’ conclusions. Others tweeted that to meet current carbon reduction goals, Vermont is going to have to sacrifice because carbon pricing alone in the form of a carbon tax won’t be enough to help the state meet its CO2 reduction goals. them pi$$ed off yellow vests (protesting carbony baloney) could soon be coming to a theater them. VERMONT SAVING MONEY WITH A CARBON TAX? The authors of the pro-unilateral carbon tax say: About 200,000 heat pumps would save Vermonters money. That INTERFERENCE IN THE MARKET PLACE would make heat pumps look good by comparison. But that interference would save NO MONEY. What about other heat pump costs, such as for leasing or amortizing, and for scheduled and unscheduled maintenance? Are our elected officials stupid or do they think we are? They KNOW we are (they think). No, our elected officials are not stupid, but some of them think we the people are. Especially those officials who have been running the state for too long. When you accept theories as fact, you open up the door to big disappointments. Global warming, carbon emissions, and evolution are some of the theories that are touted as facts, when in fact they are only half-baked theories of the human mind. So many statistics are massaged to make the case for the agendas of our elected officials. We are losing our humanity, our morals, and our ability to think for ourselves. Worst of all, our nation is crumbling under the weight of misinformation propagated by those who think they know better. Do you recall this? We the People of the United States, in Order to form a more perfect Union, establish Justice, insure domestic Tranquility, provide for the common defence, promote the general Welfare, and secure the Blessings of Liberty to ourselves and our Posterity, do ordain and establish this Constitution for the United States of America. What part of this does our Media and elected officials not get? What part of this exist today? Personally, I believe, we the people are still a majority in this nation. Until we, as a majority, decide to put a stop to all the nonsense that is taking place, then we must suffer the consequences of decay. CO2 emissions from volcanoes don’t count. One volcano emits more “junk” than all of mankind. Alaska has the most (many active, seen them when there) in the US and in the Pacific circle of volcanic activity. Will the Montpelier crowd try to stop or regulate them? They have that mentality. Mother Gaia cannot hurt us, sez the hippy trust funders and just plain red diaper doper babies. They do not acknowledge any carbon “pollution” from nature. You may have noticed their insistence upon man-made CO2 (which cannot be distinguished from the natural type). Should anyone be surprised? In typical Dem/Prog/Lib style, they root around until they find info which supports their position. If twenty studies debunk the viability of one of their goals and one study supports it, then it’s wow, let’s proceed. They only listen to “experts” agreeing with them. This is hardly the first time and if they keep getting reelected, which is unfortunately a forgone conclusion, nothing will change and things will get worse. It’s true, “You can keep your insurance and you can keep your doctor, and you will pay an average of $2,400.00 less in premiums a year” It’s as true as this…………..
Driving during and after the big snow, every solar panel was covered by a foot of sticky snow. Snow shuts off solar power, sometimes for days. Nuclear power for all, with breeder reactors to recharge the “used” fuel. Reports are for estimated 1500 private jets arriving for the carbon talks at Swiss ski resort. Wind and solar are minimal or near zero about 30% of the hours of the year in New England, per ISO-NE hourly grid operating data. Any high levels of wind and solar on a windy sunny day, would require gas turbines to quickly vary their outputs to offset the quickly varying outputs of wind and solar so the grid supply is exactly equal to the user demand. Batteries could also be used, but at about $500/kWh, for a system that would last 12 to 15 years, that would be off the charts expensive. In addition, the outputs of batteries deteriorate about 10 to 15% over their lifetime, which means one has to install additional capacity, kWh, to offset that loss. Wind and solar are cripples. Hi William, Data available says that when wind velocity gets too high, they have to shut the Mills down I believe like aircraft props by “feathering”. I can’t understand why they don’t have speed limiting internal centrifugal clutches to keep the Mills operating by the amount of Feathering prop angles regardless of the air velocity to maintain rotation and producing. Am I too complicated? I’m a pilot and have some aeronautical skills. Blades are feathered when winds exceed allowable speeds. The turbines’ output would be MAINTAINED at about 95% of rated. Such conditions are very rare in New England, may be up to 100 hours per year. The AVERAGE out put of ALL wind turbines in New England is about 25 to 28%; it varied with the windiness of the year. 2) Seasonal variations (storing wind when it is more plentiful during fall, winter and spring, and when solar is more plentiful in summer, so more of their electricity would be available in summer when wind usually is at very low levels). See URLs. That storage would need to have a minimal level at all times (about 10 days of demand coverage), to cover multi-day, scheduled and unscheduled equipment and system outages and unusual multi-day weather events, such as a big snow fall covering the solar panels and minimal wind. – One TWh of storage costs about $400 billion, at $400/kWh, or $100 billion at a Holy Grail $100/kWh. – Any electricity passing through storage has about a 20% loss, on a high voltage AC-to-high voltage AC basis, to be made up by additional wind, solar and other generation. – Batteries lose about 10 to 15% of their capacity, kWh, during their lifetime, which means additional capacity has to be installed to offset that loss. – Any electricity fed to EVs and plug-in hybrids has about a 20% charging and resting loss, from wall meter to “in battery”, as indicated by the vehicle meter, to be made up by additional wind, solar, and other generation. Thanks William, great knowledge, reason for reading comments such as yours, very constructive. There’s knowledge here, no put downs as experienced herein. I thrive on knowing new things. Put downs produce nothing. Also interesting are comments by Stu Lindberg and Jay Eshelman just to name a few (don’t mean to eliminate many others). Sen Benning of Caledonia has a bill S11 to limit the number of Senators in a county, no dominance. Great. That’s one main problem in VT, another is to confine the school education system and their unions and NEA. But, how to get this grassroots knowledge to Montpelier Liberals that are so closed minded “feel good” mentality? The Montpelier elites need a good flushing. There’s more intelligence in these comments than from Montpelier, just look at the pending Bill they are filing. The people have a mountain to climb in Vt. The State selected that outfit to perform the study so the State would have a “cover your a..” document for “skeptical” legislators, who merely need a plausible package of lies and half truths to present to the voters. The voters will be promised a bed of roses, but will get a bed of thorns, unless you are a low income voter who votes Dem/Prog. For those voters there will be expensive, inefficient government-bureaucrat run programs that provide UNILATERAL carbon tax money to those voters to drive electric cars, get heat pumps, insulate and seal their houses, or provide them with new houses. Not to mention that in the Oligiocene – about the time birds evolved – the CO2 values isotopically were low while the temperatures were extraordinarily high (016-018 isotopic archaeo-temperature measure). That was in the Cenozoic Era c. 11 million years ago. By talking like this, the pols – and the idiots who listen to them and vote for them – think we are speaking voodoo magic and mock us for the same. Nice, huh? Living in amid the New Age wunder kinder apes? As I was reading through the print, I was thinking”: I do not believe a word of this clap-trap. Fortunately, I have some company; then the question becomes; do we have enough company? I think so, but we have some work to do. Reducing carbon dioxide isn’t going to make anyone healthier. Increasing the cost of energy and transportation isn’t going to make anyone healthier. 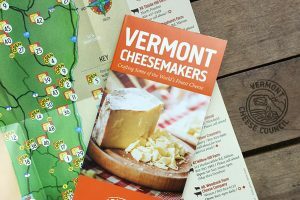 Increasing the cost of operating a business in Vermont isn’t going to help anyone and making Vermont businesses less cost competitive isn’t going to help business or motivate startups in Vermont. Reducing the disposable income of the middle class and the wealthy and increasing overhead costs of businesses won’t help employment and will slow the cash flow upon which Vermont’s revenues depend. An often overlooked point: If the results of any program undertaken by government will have patently predictable negative consequences those consequences are deliberate and intentional. The goal is government empowerment and centralization of government control. A terrifying example of this: If the Democrat coup had succeeded (and they have not given up), the inevitable and predicted collapse of Obamacare would have enabled the Progressives (like Bernie) to implement Single Payer, the citizens be damned. “….without hurting the economy or low-income residents.” Quite frankly, I don’t give a DAMN about ‘low – income residents”. In fact… I am SICK of “low-income” residents! Soon, these fools in Montpelier will turn me into a low income resident! And that is their intent! Worry about us in the middle, you idiots! WE are the ones who pick up all your damn tabs for the “low-income”! From the start, this scheme, based on the fraudulent threat of CO2, has been about wealth redistribution. Some people will receive subsidies while others will take a beating, such as small businesses and the already dwindling Middle class. Left unchallenged, these proposals will drive anyone with the means to live elsewhere. Those remaining will struggle as the cost of everything goes up, and the State will struggle as revenues go down while all their welfare programs increase. This “study” is a huge pile of BS – just what the Dems and Progs ordered. 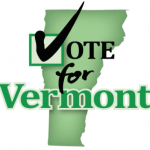 Carbon Tax ” Boondoggle ” …..Will be too costly for Vermont to support ??? The big issue is the people they are presenting to are incapable of common sense. This will drive more people and businesses out of VT. Border towns will be especially hard hit. Why would I pay more for gas in VT when I can drive to NH and save? So we will put all the Convenience Store that sell gas in VT border owns out of business. They have all completely lost their minds!